Disney is now selling limited edition t-shirts celebrating the 30th birthday of the greatest theme park ride ever created: Horizons! 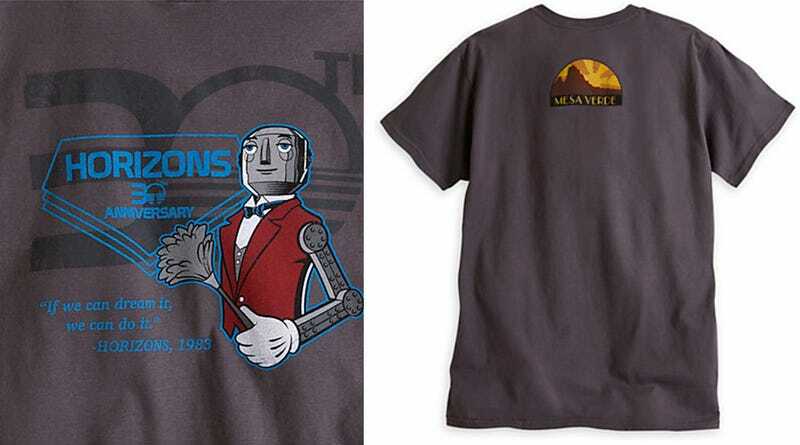 The shirts come in three styles, all inspired by different sequences from the end of the ride: Mesa Verde, Brava Centauri, and Sea Castle Resort. One of the coolest things about Horizons was that you got to choose (or, more accurately, your jerk older brother got to choose) how you wanted the ride to end. The Mesa Verde sequence took you through the desert farm of the future, the Sea Castle option took you to a futuristic undersea outpost, and the Brava Centauri version took you to the space colony of tomorrow. Strangely, the space colony shirt says "Omega Centauri" rather than Brava Centauri. Am I missing something? Is this like a new upside down stamp for Disney nerds? Anyways, if you want one, the shirts are only available for purchase online from November 21st until November 25th. Thanks to A. M. Manuel for the tip!